The town of Montecatini Terme is undoubtedly one of capitals of European spas and developed around its most precious resource, its waters, whose beneficial effects on the health were known since antiquity. The town was known by the name of Bagni di Montecatini and only in 1928 took its present name of Montecatini Terme. One of its striking features is the large green area located in the town centre with a the spa park occupying 460,000 square meters. The Tettuccio Spa is the "centre" of the spa, the "parlour" of the town. The Tettuccio regularly hosts Estate Regina inaugural concert and generally symphonic, choral and opera concerts. It has excellent acoustics, appreciated by the great soloists and conductors who have taken part in the festival and can accommodate up to 1200 spectators. 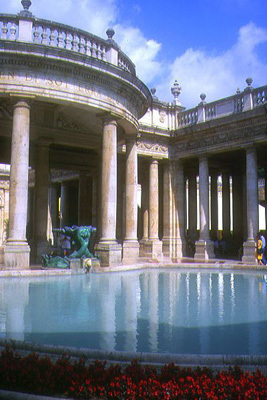 It was the Grand-Duke Leopoldo who had the thermal bath built, with its palatial facade considered today a national monument. 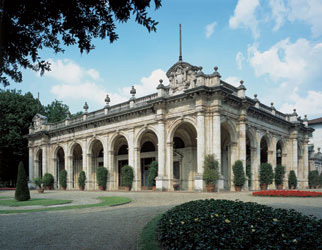 The architect Ugo Giovannozzi built the other parts at the beginning of the Twenties, along with Basilio Cascella who decorated the Water Gallery with majolica, travertine and marble, Carlo Moroni and Galileo Ghini who decorated the Reading and Post Hall. Maria Biseo frescoed the walls of the Tettuccio Café, one of the most attractive examples in Italy of historic café, it's the ideal place for meetings, cocktails and gala dinners in conjunction with our concerts. The Regina Hall, holding up to 250 spectators is where most of the chamber, vocal and solo concerts are held, the ideal place for the "select few" to listen to music, as in a turn of the 19th century salon. The acoustics are excellent and particularly suitable for romantic repertoire. Built during the same period as the Tettuccio Spa, the Regina Hall is an imposing building in travertine with a monumental arcade and colored glass ceilings. The central hall is divided into an area formerly used to dispense water, as public hall and refreshment services. Beside the Hall is the small temple protecting the Regina spring which gave its name to the festival. Opposite the Hall is the Fountain with the Heron, symbol of the town of Montecatini Terme.